The campus community is in an uproar about the changes to Homecoming, complaining that a “segregated” tailgate defeats the purpose of the event. Students fear it will be more difficult to form connections with past members of fraternities and sororities, clubs, teams and other alumni. According to the College’s Homecoming website, Lot 4 will be fenced off and serve as the alcohol-permitted area. Those of drinking age will only be allowed one six-pack of beer per person. Tailgating will begin at 10:00 a.m. and will last through the start of the fourth quarter of the football game. Underage students can still spend their time with alumni and older friends, though. They just can’t do it in Lot 4. There is no reason why attendees who are 21 or older have to stay cooped up in one place drinking all day long. They can have a few drinks and then leave the confines of Lot 4 to mingle. One alum complained to me that he won’t get to see his brother, who is a freshman at the College. The problem is that his brother is only 18 years old. If the alumus desperately just wants to spend time with him, he could do so — in Lot 6. Or anywhere else on the entire campus. He would put family ahead of standing in a parking lot and drinking all day. Students are acting like their rights have been violated, but nowhere is drinking underage any kind of a right or a privilege. The petition on Change.org penned by Mike Griffith, class of ’13, calls the changes to Homecoming “oppressive,” “arbitrary” and “authoritarian.” Many of the comments on the site complain that the implementation of these new rules shows that the College doesn’t trust us. But if the College doesn’t trust its students not to drink underage or not to drink a dangerous amount of alcohol, it’s because we haven’t given it a reason to. At last week’s Student Government meeting, Chief of Police John Collins said that at Homecoming 2013, there were students collapsing drunk in the parking lot before noon. There were 24 citations written for underage drinking, 13 more than the previous year. Older students slipped off their silver wristbands that signified they were of drinking-age, passed it over to a younger friend and then re-entered the tailgating area as if they hadn’t already received a wristband. This allowed younger students to drink openly, if not illicitly. Four students were transferred to the hospital during the event and two were transferred later that night. In 2011, only one student was medically transported during Homecoming. As officers whose duty it is to protect students’ well being, are they supposed to ignore these increasing numbers? One of the major arguments against the changes is that students who are not yet 21 might over-consume alcohol in their rooms prior to the event since, this year, it’s tougher for them to illegally drink in public. “This is a high risk, as the rapid intake of alcohol can cause alcohol poisoning and result in hospitalization or death,” senior technology education major Dalton Fowler commented on the petition site. Fowler is right, but it’s absurd to imagine that the College would allow underage students to drink alcohol at an event so that they don’t binge-drink beforehand. If trust from the College is what you’re looking for, don’t get blasted and make a fool of yourself at a school event. Another argument is that the changes will alienate alumni, discouraging them from donating money to the College. Alumni donate because they want to give back to the school that has given so much to them, not because on one day a year, they get to hang out and drink with younger students who are in the same organizations of which they used to be part of. Many are angry about the rule that follows Fraternal Information and Programming Group guidelines limiting the amount of alcohol. Maybe the College is counting our drinks because last year, students drove in pickup trucks filled with dozens of cases of beer and drank till they were sick. When some people take advantage of the system, it’s understandable for the administration to respond by setting limits. There is no need for such an excess. To supplement the reduction in alcohol allowed at the tailgate, the College is even hosting a beer garden in the Rathskeller from 3:30 till 6:00 p.m. There will be a DJ in each of the tailgating lots. Organizations will be performing songs, dances and comedy acts. There will be a rock wall and an inflatable Quarterback Challenge, game booths, prizes, food and face painting. There will be, of course, a football game, where our new Pep Band will be making its debut appearance. Shouldn’t we be focusing on all of that? Or can we not have fun and demonstrate school spirit without getting plastered? 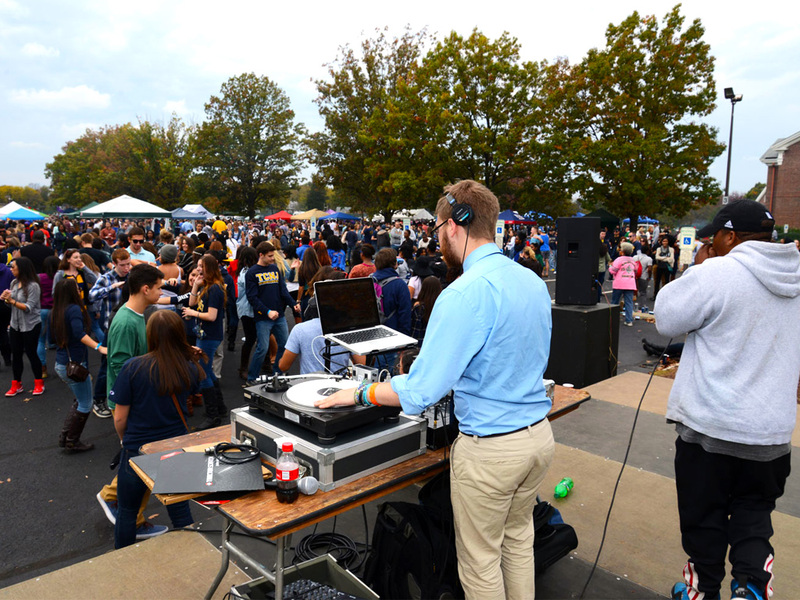 Tags: homecoming, tcnj, the college of new jersey. Bookmark the permalink.